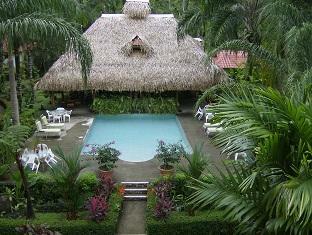 ﻿ Best Price on Hotel La Palapa Eco Lodge Resort in Portalon + Reviews! Offering an amazing rainforest setting, La Palapa Eco Lodge Resort features an outdoor swimming pool and accommodations overlooking its tropical gardens. It has an ideal setting for bird watching and is 1.9 mi from Matapalo Beach. All bright accommodations at La Palapa Eco Lodge Resort has traditional Costa Rican décor, African ornaments and cooling tiled floors. There are screened windows and a private bathroom. Bungalows also include a kitchen and a living area. Additional cots are available upon request. Served in its open-air restaurant, La Palapa offers a traditional Costa Rican breakfast, including fresh fruit and local dishes such as Gallo Pinto. Meat, fish, rice and bean dishes are on offer for lunch and dinner, and are prepared using produce grown on the resort’s organic farm. The property also offers free WiFi. The surrounding Portalón rainforest is home to a range of birds and butterfly species and provides an ideal location for hiking and cycling. Playa Linda and Dominical beaches are within 9.3 mi of the Eco Lodge, and there is also a sea turtle refuge center nearby. The resort has private parking with security 24 hours a day for the guests.